Non-communicable diseases (NCDs) already kill the majority of Africans, though almost all the public health focus is on the continuing burden of communicable diseases. Documenting the role of built environments in physical activity, sedentary behaviors, and NCDs can provide an empirical foundation for environmental improvements contributing to NCD prevention. Research on built environments and physical activity has expanded rapidly throughout the world, except the continent of Africa. Our colleague Adewale Oyeyemi conducted the first built environment and physical activity studies in Nigeria and documented the relevance of this research field for Africa. Adewale adapted the Neighborhood Environment Walkability Scale (NEWS) for the Nigerian context and found several associations with physical activity that were consistent with results from higher income countries (Oyeyemi, 2013). For more than two years I have been trying to organize an initiative to develop an Africa-wide version of the NEWS. Vickie Lambert, from the University of Cape Town in South Africa and Director of the African Physical Activity Network (AFPAN), identified investigators from several countries who were interested in this research field. We have been working on the mechanism to provide a modest amount of funding to support the development of NEWS-Africa and reliability/validity studies. This effort was accelerated when Mark Tremblay from the University of Ottawa in Canada inquired about the applicability of the NEWS for a multi-country study of youth physical activity his group was planning in Africa. I informed him of our plan to create a NEWS version for Africa. We agreed to collaborate on the development of NEWS-Africa that could be used in his study, funded by Canada’s International Development Research Centre, Adewale’s NIH-supported IPEN Adolescent Study, and hopefully other studies on the continent. Vincent Onywera, a long-time collaborator with Mark, agreed to host a workshop at Kenyatta University in Nairobi, Kenya. Adewale led the development of the agenda, and I assisted. 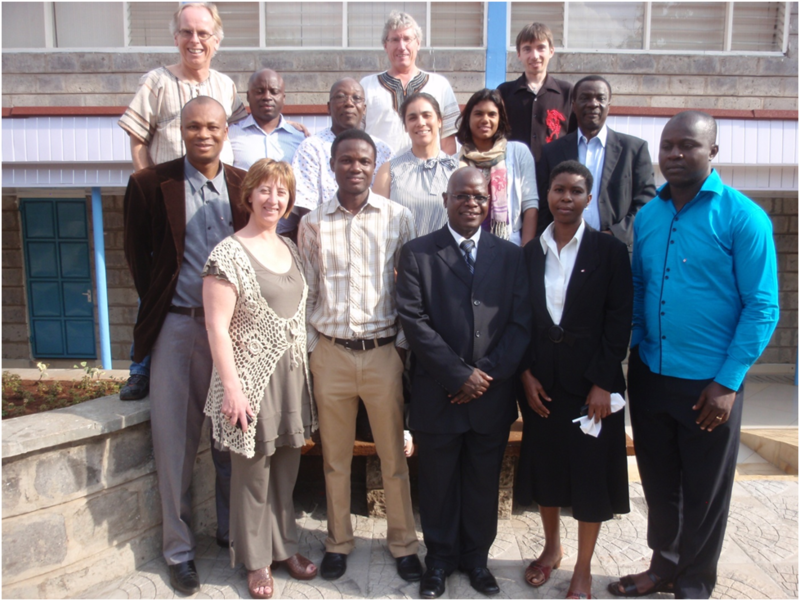 The NEWS-Africa Training Workshop was held August 19-21, 2013 in Nairobi. Fourteen people attended representing Ghana, Kenya, Nigeria, South Africa, Uganda, as well as Canada and the US. An investigator from Cameroon was unable to attend but may participate in the project. On Day 1, the main activity was to discuss how NEWS-Nigeria could be adapted to be relevant throughout Africa. The goal was to reflect urban and rural environments, be applicable across the lifespan, and retain some comparability to the original NEWS and especially to NEWS-Abbreviated (Cerin, 2009). We went through all the sections of the survey discussing the relevance of each item for Africa, modifications of current items, and additional items needed to reflect African environments and cultures. Several items were added to characterize rural environments. This productive day resulted in many adaptations to make this a truly African instrument. The main goal of Day 2 was to test our ideas in the real world by visiting neighborhoods and talking with experts and residents. Vincent recruited some true experts in urban planning, transportation planning, and public health advocacy. Each provided useful background from their professional perspectives and offered input into components of the NEWS. 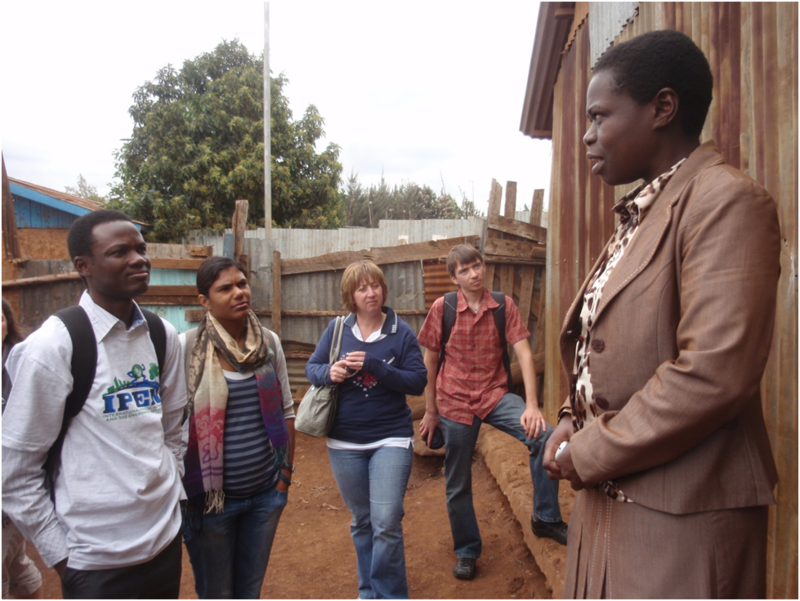 Our interviews with community residents was particularly dramatic because they took place in Kibera, which is the world’s largest slum. It is a huge and bustling, though poor and dangerous, community. The inadequate infrastructure was apparent from the lack of plumbing, limited play spaces, piled up garbage, and walking paths that also served as drainage ditches. Adewale Oyeyemi and others meeting children in Kibera slum. 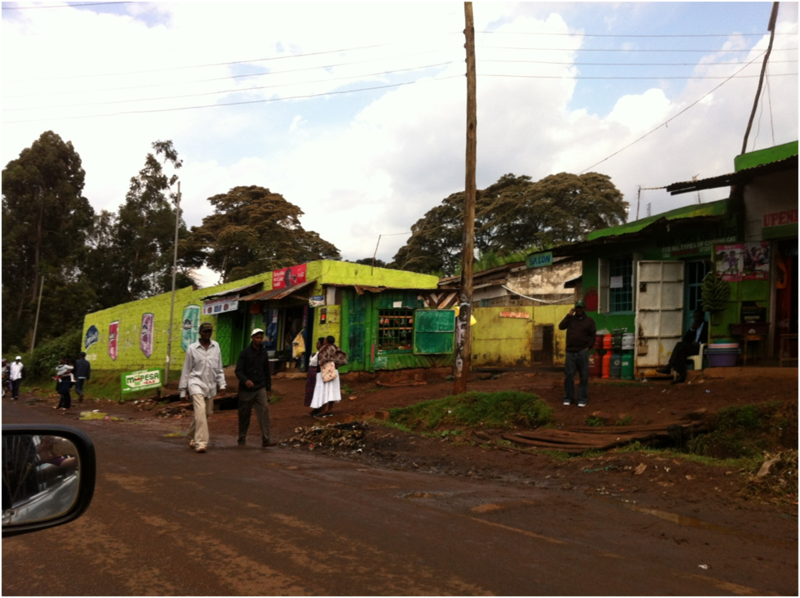 A streetscape view in Kibera. Despite these challenges, the community has many strengths. We spoke with two women in a women’s empowerment group. They informed us of the positives, such as proximity to shops to take care of most daily needs, sense of community, and nearby schools. 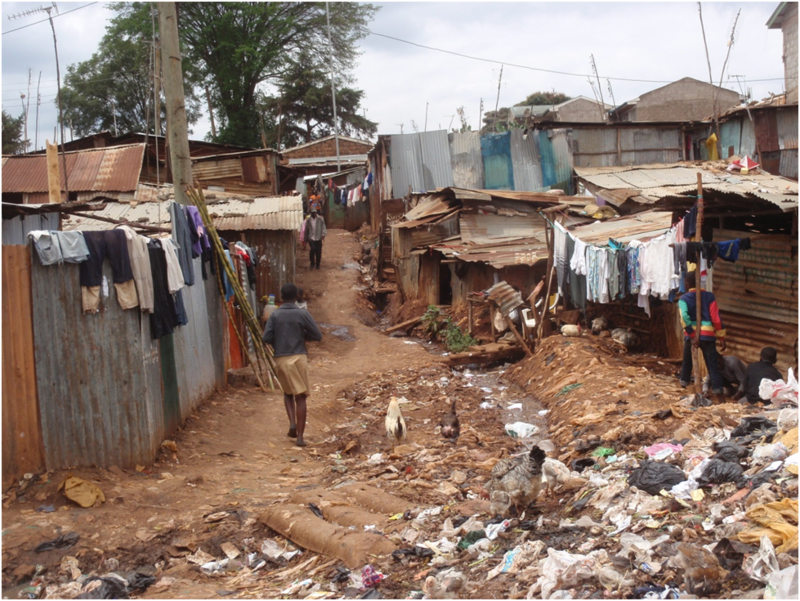 Negatives included ever-present security concerns, high cost of goods within Kibera, many women spending virtually all their time in their houses, and need to walk long distances for groceries. 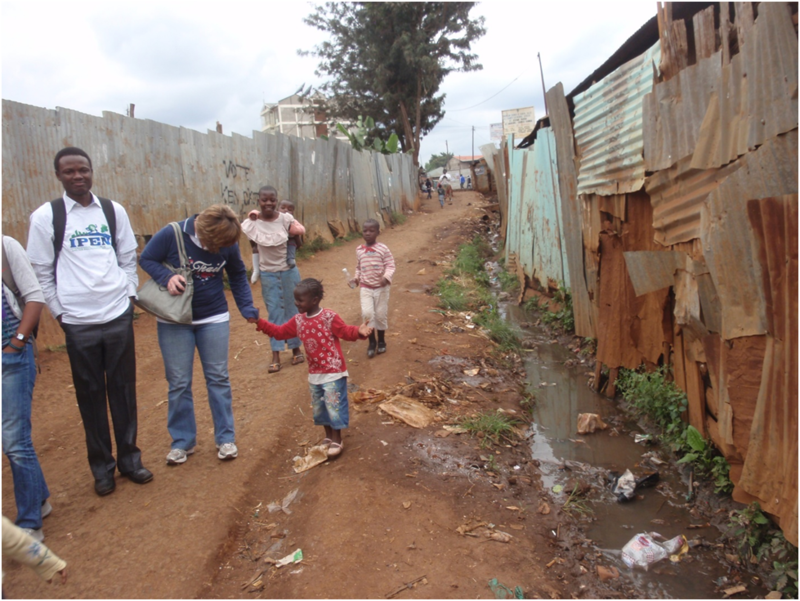 One woman estimated she walked 2 hours per day, and Kibera is clearly a walkable area. We talked to an articulate 10-year-old boy who told us about his daily life. He spends most of his non-school time at the library, studying at home, watching TV at home, or playing video games at an arcade. Thus, his physical activity seemed limited. Open fields were available at the edges of Kibera, and we saw plenty of young people playing soccer there. A special moment for me occurred during a short meeting with the women’s group. The Director, Anjanga, explained to them our interest in physical activity. They immediately rose up, sang a song, and inspired us all to dance. In the evening we went to dinner, a very high energy demonstration of African dancing, and more dancing to the live band. 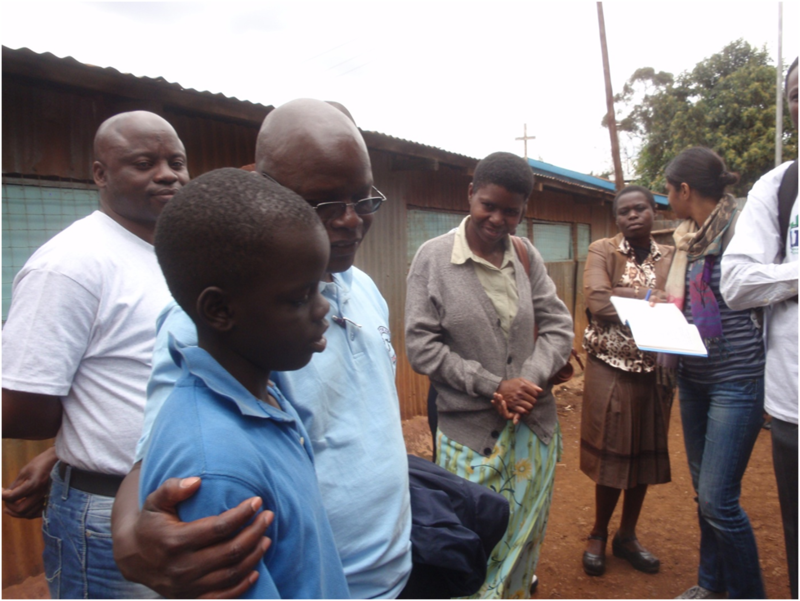 Vincent Onywera and others interviewing a boy about opportunities for play in Kibera. We started Day 3 by reflecting on the experiences from the day before. There was strong consensus that the interviews and observations confirmed that we were on the right path with the modifications of the NEWS discussed on Day 1. Issues such as connectivity and pedestrian infrastructure did seem relevant in the African context, though somewhat differently than in North America. We were able to contrast the total neglect of sidewalks in Kibera with a brand-new installation of well-designed sidewalks, bike paths, and crosswalks in an upscale neighborhood. We learned that the World Bank and other donors were requiring pedestrian and bicycle facilities on roads they built. We considered this a positive development, because the facilities provided a good model of how to improve quality and safety of the pedestrian experience in Nairobi. We ended the workshop by discussing the protocols for completing the draft of NEWS-Africa, refining it, and completing reliability and validity studies. Investigators in each country will interview experts to obtain their feedback on the draft survey and local residents to determine if further additions or clarifications are needed. Then each country will conduct a test-retest reliability and validity study. The goal is to complete multiple studies with youth, adults, and older adults. Participants will be recruited from high/low income, high/low walkability, and rural settings. Main analyses will be conducted with pooled data from all countries, hopefully with age-specific analyses for youth, adults, and older adults. 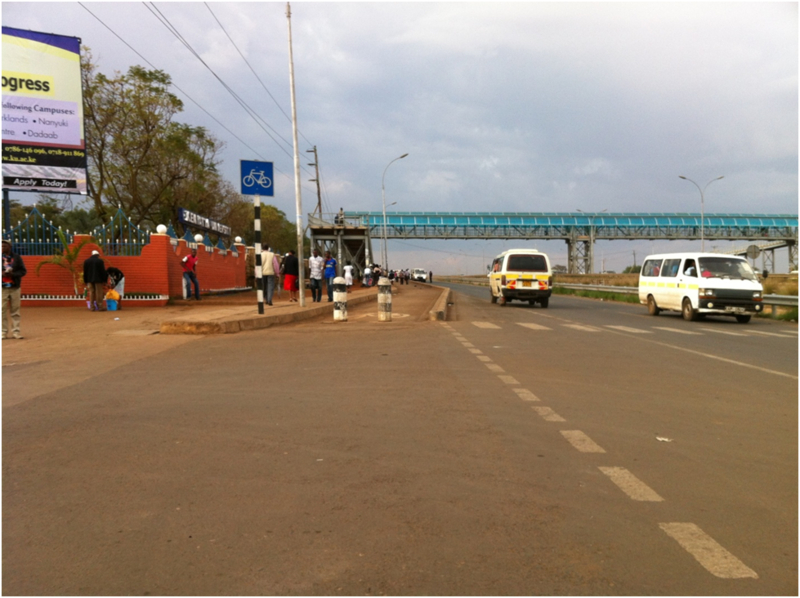 A new highway in Nairobi, required by the funders to include facilities for bicycling and walking. A more typical situation for pedestrians in Nairobi. The NEWS-Africa workshop was a delightful experience in the pleasant Kenyatta University Conference Center, with stimulating discussions and most importantly, new relationships with colleagues throughout Africa. The workshop created a unified sense of mission in the group. My hope is that the development and evaluation of NEWS-Africa is the first step on a productive road. Next steps will be more studies on built environments, physical activity, and health outcomes throughout Africa and use of those data to inform policy and practice in multiple sectors of government and society. We met some valuable partners in Kenya, and investigators will be identifying similar experts in their countries. Everyone left the workshop satisfied with the work we have done. I am pleased that IPEN played an important role in this initiative. This workshop helps fulfill IPEN’s goal of building capacity for environment and physical activity research worldwide. NEWS-Africa has now been conceived, and we are looking forward to the birth of a new instrument in 2014 that is tailored for Africa and contributes to preventing further growth of the NCD epidemic. By drjamessallis in Uncategorized on August 29, 2013 .
i found your work with NEWS and its application to the African continent quite interesting, from my experience growing up in Uganda, and traveling and living around the world. i am currently a student at Eastern Kentucky University in the Master of Science in Physical Education program, and my research interests center around the built environment, physical activity, outdoor recreation, and public policy. This is John Doku Nartey from Ghana. I am currently in Kenyatta university to study MSc. Sports and Exercise Science. I will be working with Prof. Vincent Onwyera to guide me on what to do for my project or thesis. Maybe you can be of help too if there is any collaborative project in place. Hoping to meet you one day. John, thank you for your comment. Please send an email to jsallis@ucsd.edu, and Dr. Sallis will respond.